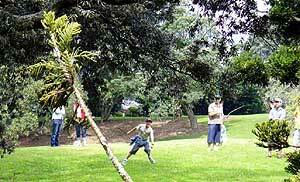 Have A Go - Discovering Disc Golf in Auckland, New Zealand. 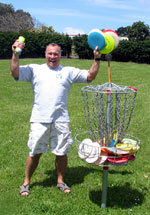 Bob is Happy - Have A Go Day coordinator Bob Gentil alongside a disc golf basket full of colorful discs for all the participants to use. "It was a good day", commented Bob, "everyone seemed to enjoy themselves and got to 'disc'-over what disc golf is all about!" 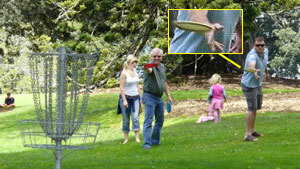 How do you get the Frisbee in the hole? Do you hit it with normal clubs? 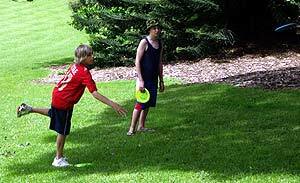 What sort of Frisbees do you use? Are there different ones for driving, up shots and putting? Wow! How do you throw it so far? Are there regular competitions around the country? I'd like to meet the Mangere Bridge Mexican Juan Unda, Will he be there? These are just some of the questions that were answered at the first Auckland City Council 'AkActive Disc Golf Have a Go Day'. On Saturday October 28th in the beautiful made for Disc Golf Monte Cecilia Park. Over 50 people turned up to try out the sport of ‘Disc Golf’ from as far away as the North Shore, and even a couple from Australia. 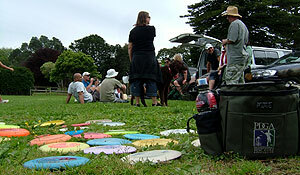 The Auckland Disc Golf regulars including the current National Open Champ Simon Feasey and Masters Champ Marty de Haas hosted groups around a shortened 7 hole course set up for the day, passing on the etiquette of the game and giving tips on how best to make a Frisbee fly. The feed back was all positive with many family groups keen to come back and improve their skills. I even heard it mentioned that one church group who came along were planning their own regular competition. Thanks to our helpers and everyone else who came along to ‘have a go’. 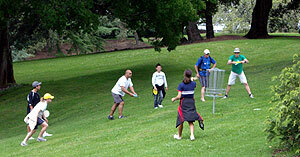 The next ‘AkActive Disc Golf Have a Go Day’ will be November the 18th. Once again in Monte Cecilia Park, Delargy Ave Hillsborough [second left off Hillsborough Road from Mt Albert Road] from 1 till 3. Freaky Styley - The Freaky Styley Fat Tyre Flyers were well represented on the day. From left: Nathan, Auntie Debbie, Gee, Josh, Bridget, Juan and Virgil. 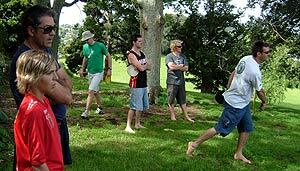 Feel The Grass - A casual game of disc golf can even be played in bare feet when you are at a great park like Monte Cecilia..
Coach Baz - Regular golfer Baz Keene brought some of his friends along from his church group who wanted to find out what this crazy game was that he played. Now they're hooked!. The 'Lean' - Participants quickly learnt 'The Lean' - that involutary body lean designed to encourage the disc to turn mid flight. We're not sure about how effective this is, but we all try it!. The Agony - Another quick lesson learnt was how a wondeful shot can simply pop straight back out of the chain. Ah, the agony!. Nice Action - National Champion Simon Feasey encouraged his buddy Michael van Meygaarden out to try out disc golf in an effort to drag him from his video games. Yet it looks like his finese with the joystick has translated perfectly to this sport. Mike was on fire with accuracy we normally only see in the country's top ten. 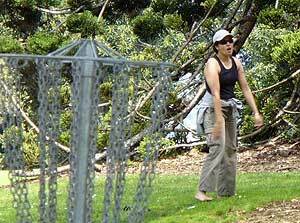 The Lob - With a tricky group of trees all around her, this beginner throws a gentle lob to make it up to the basket. 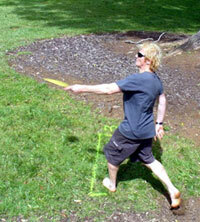 Drawfed - First time disc golfer Gee Goldsmith is a pretty big bloke. But here he is dwarfted by the 100yr + palm tree in the middle of the park. Young Skill - The kids sure pick this thing up pretty quickly. 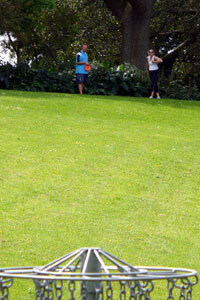 Here Lief (8yrs) does a stylish run up encouraged by Mr Disc Golf NZ himself, Bob Gentil. Putting Partners - See the fine putting technique of this unlikely pair. And they were both playing for the first time! We Love This Park - What a way to spend an afternoon! 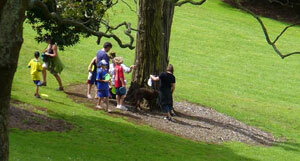 Learn About the Trees - Groups took time out to marvel at the magnificent specimens at Monte Cecilia Park. Many of these trees, including a mighty Kauri, are well over 100 years old. Smart alec Gabb asked Bob if he planted them!. And They're Off - This group had so much fun, they asked to go out for another 7 holes! Nice Action 2 - Nathan Rogers (13 years old) walks up to the tee and drives with the ease of a seasoned golfer watched by a proud Auntie Debbie. 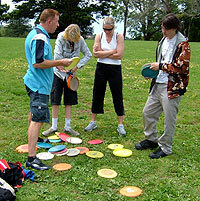 Coach Baz - Everyone quickly learnt that disc golfers are great people, happy to share tips and secrets. Here Baz reveals that correct colour choice is the major factor that got him into the nation's top 20. 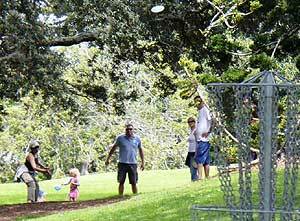 All In The Family - Young and old alike flocked to Monte Cecilia to enjoy this beautiful park and take in the fun of playing disc golf. 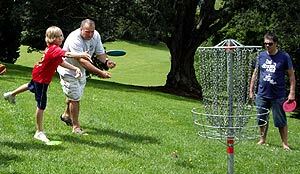 "Now Watch Carefully Son" - Mike Wilde is quick to admit to his son Jonathan that he doesn't know everything about disc golf - he makes sure Jon takes in the skills of Simon Feasey who has won the New Zealand Disc Golf Tour every year since 2001! Not to mention a few international awards too..
'That Was Fun!" - After a few hours in the sun, our new golfers gathered for a bite to eat and to discuss what fun disc golf is.